In addition to the development of smart cards and biometrics, there is another important technology that has arisen which will ultimately be merged with them as the world moves toward the final economy of the Antichrist. Radio Frequency Identification (RFID) is a wireless communication technology that uses microwave or ultra-high frequency (UHF) electromagnetic signals within the radio spectrum to send digitally encoded data between a tag and a reader, which can then be used to identify and track items. 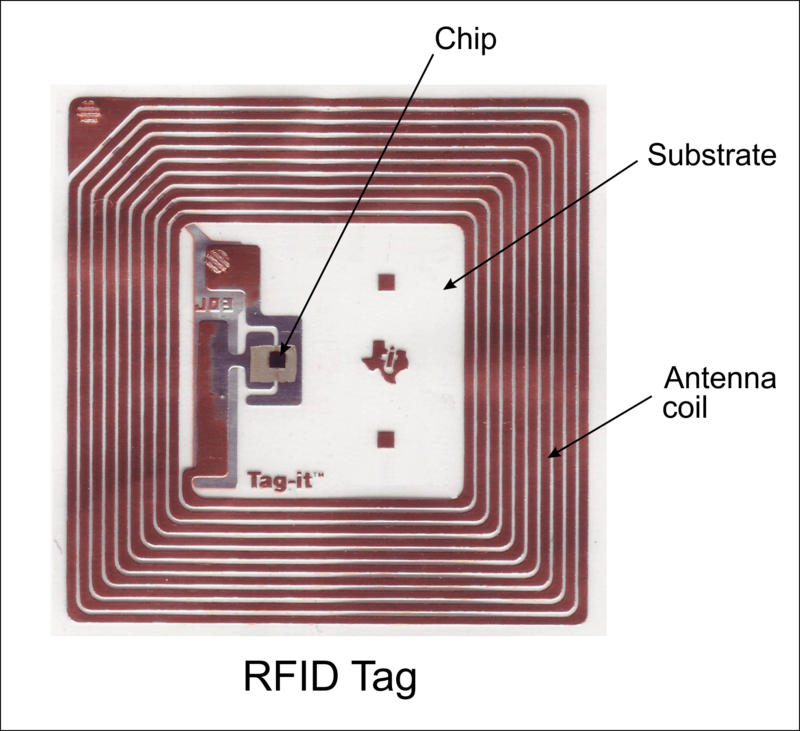 An RFID tag can be relatively simple in design, but powerful in its potential applications. The basic elements of a tag are: a microchip containing nonvolatile memory and an antenna to collect and transmit radio waves. The chip contains circuitry that stores a unique binary number in its memory and the antenna serves as the receiver and transmitter of information. The antenna is much larger than the microchip and typically consists of loops or coiled wire extending out from the chip. In a passive or unpowered RFID tag, the wire loops serve two purposes: 1) to transmit information (the stored encoded ID number) and 2) to act as a power source for the microchip using electromagnetic induction, which is caused as the RFID antenna picks up the radio signals emanating from a reader. When a nearby RFID reader sends out a radio signal that is received by an RF tag, it causes an electromotive force to occur within the wire coil of the RFID antenna. This in turn causes electrons to flow within the wire. This electron flow within the coil is the electrical power source for all passive RF chips to operate. The induction process causes the microchip to be powered up and respond by sending out a radio signal containing the identification code stored within its memory. Thus, when a reader “wakes up” a RFID tag, it receives back a radio transmission containing the tag’s unique ID number, which then can be used to determine exactly what is labeled or associated with the tag.